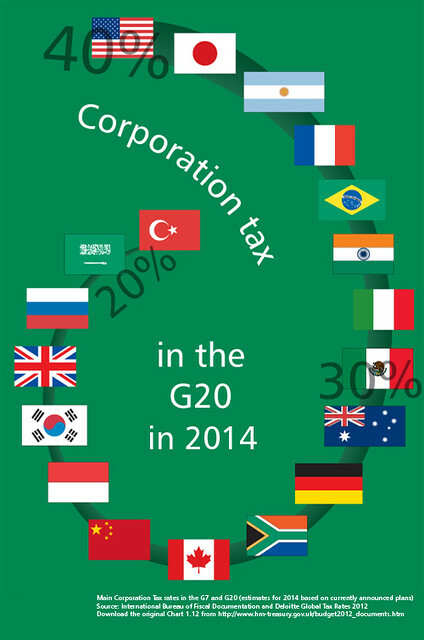 Liebrary: Does the UK have to keep reducing corporation tax to tempt businesses to come here? "Stopping the lies is an impossible task. But spreading the truth just takes a re-tweet." With the Chancellor's Budget announcing a drop in Corporation Tax down to 22% in 2014, her Majesty's Treasurers got their crayons out and came up with this super poster. 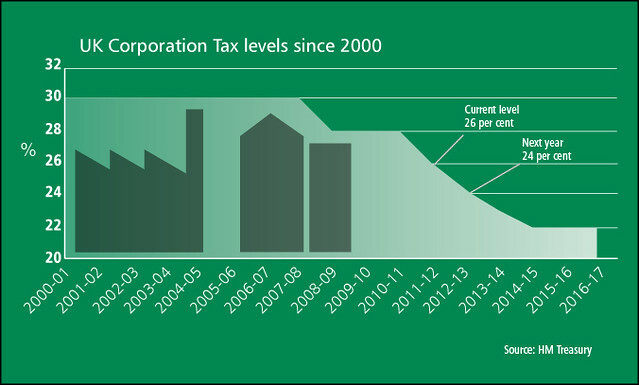 It Demonstrates very effectively how low Britain has dropped its Corporation Tax. With only Turkey, Saudi Arabia and the Russian Federation offering lower corporate tax rates, how much lower can the Chancellor get? As an added temptation, the Chancellor has offered the 'patentbox' scheme offering a 10% corporate tax rate. This is available for profits made on intellectual property and patent licencing income. Not much job creation there. No factories needed, just a couple of guys counting the money as it rolls in. But the chancellor has worked out that if someone is going to get their tax, it may as well be him. Should I have said "it may as well be Britain"? Not really. Politicians collect the sugar to distribute to whom they will, in return for what they want. For example, tax cuts for millionaires paid for with tax hikes for pensioners. So why, inspite of all these temptations, are all those companies still incorporated in the US, Japan, Germany, France and other countries who charge oodles more corporation tax? Could it be that British Chancellors, from Gordon Brown through Alastair Darling over to George Osborne have not yet learned the lesson of the nightclub slapper? A short skirt only guarantees you a drafty backside! And yet, the message from a succession of Chancellors - Britannia is ready to drop everything to get your business. Improving infrastructure, investing in training and education, they would make Britain more competitive and attractive to business. But investing in Britain and in Britons costs money. Much easier to cut the rate of tax. Britain becomes ever more like a tax haven for companies and foreign oligarchs. But not if you are an ordinary domiciled ripped-off Briton. BBC reports: "UK hourly labour costs have fallen nearly two euros (£1.7; $2.6) below the EU average, data from the EU's statistics agency Eurostat show." We have low corporate taxes and low wages, and still no growth. Evidence that cutting taxes and cutting salaries is not the answer to our economic crisis.